For many tourists San Telmo starts at Plaza de Mayo and stops at Plaza Dorrego – very few will venture southwards and beyond San Juan the tourist traps dry up and the area buzzes with local flavour. 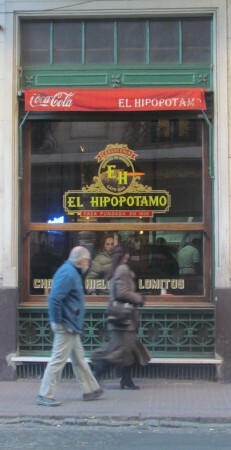 The bar dates from 1909 but it has not always gone by the name it has today. Originally called La Estrella del Sur, and later renamed to Don Pedro (it stands opposite a statue commemorating the city’s founder Don Pedro de Mendoza) the owner gave it its current moniker about 30 years ago as a tongue-in-cheek tribute to an upscale establishment popular at the time with upper-class society. Whilst its patrons may not be as well-heeled as those of its namesake, it has outlived the original and is still going strong, offering classic Porteña picadas and café fare. 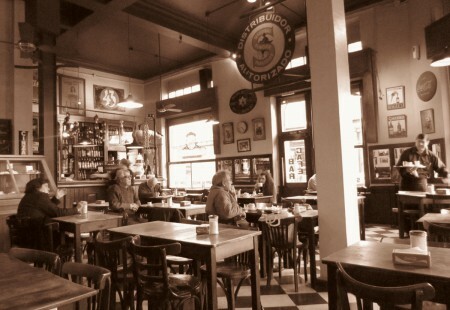 Filled with dark furniture, classic advertisements and posters, the interior has a warm feeling and large windows emblazoned with the bars logo allow some great people watching opportunities on the passing streets. It may only be a few blocks from Plaza Dorrego but the clientele is most definitely local and when I visited most were nursing a cortado, glued to the TV playing silently above the door. 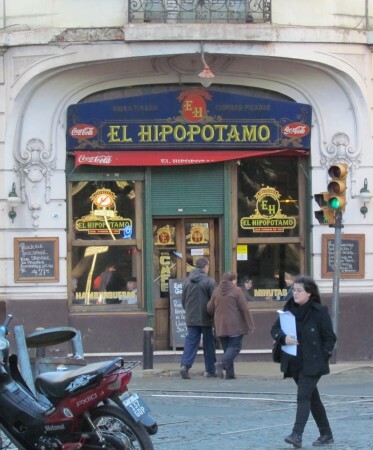 El Hipopótamo is in a great location, literally across the street from another Notable Bar, Bar Britanico, and at the entrance to Parque Lezama, one of the most interesting parks in the city. 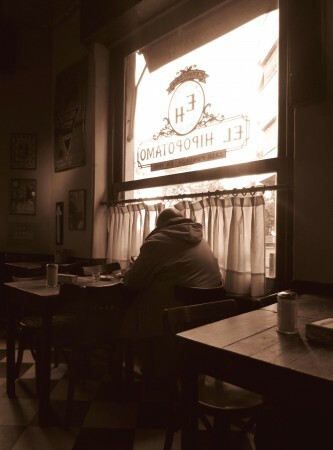 With its warm, cozy interior El Hipopótamo is well worth continuing the couple of blocks past Plaza Dorrego to experience one of the most classic bars in San Telmo.